03/16/2019 | Kind of Blue: KATO Tsubusa's Moon series — Dai Ichi Arts, Ltd.
Kato Tsubusa's Moon Series will finally touch down in New York for our Asia week following an impressive museum tour. Five sculptures of the moon, each with a different name and title, comprise a penetrating lunar landscape. 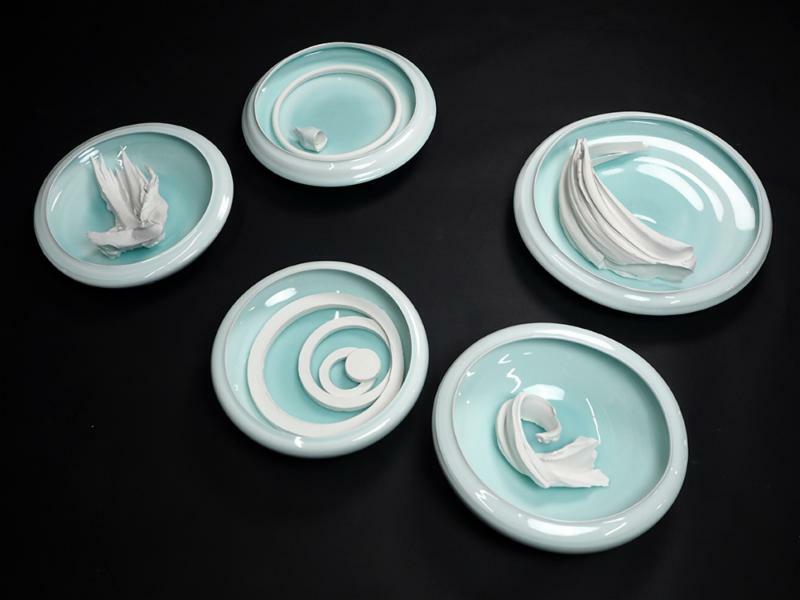 Kato uses New Zealand kaolin clay to create snow-white porcelain sculptures that oscillate between expressive abstraction and ceramic traditions. 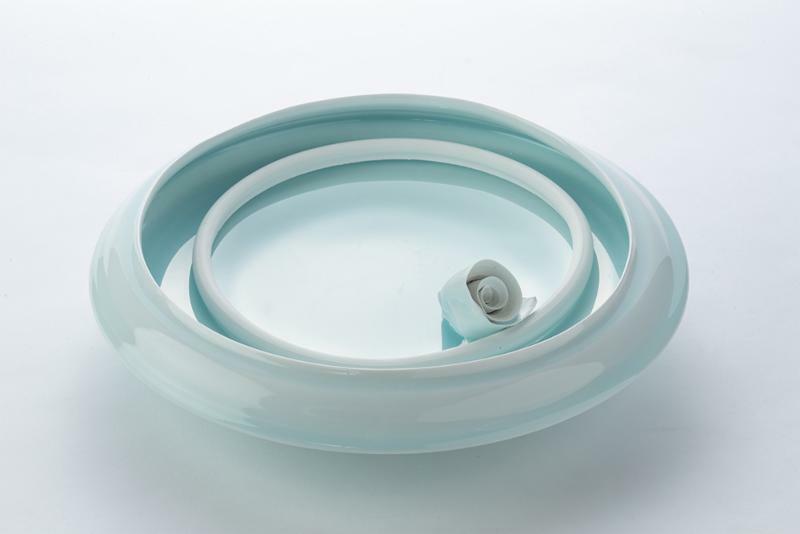 Moon Series is a group of celadon shallow bowls with unglazed removable form in each sculpture's center. Pristine variations of unglazed white dance in celadon pools, much like the changing face of the moon every time we look up to its craters and glow. Japan has a long history of celebrating the moon and its phases.Kato's moon exhibition started in Hokkaido, and traveled to Sapporo Art Park, Mombetsu City Museum of Natural History, Kushiro Art Museum, Hokkaido. In Hokkaido especially, the high altitude makes one feel closer to the moon and view its surface with more clarity. The moon is sacred, and Kato's five unique moons simulate the deep emotions it inspires. Next - Moon H4.3" x Dia14"
Tokoro - Moon H6.7" x Dia18"
Kato's Moon Series uses the ceramic medium to form a deeper picture of the moon, simulating its emotional connection to humanity. We need more than our eyes to understand the moon. In 1874 James Nasmyth and James Carpenter photographed sculptures of the moon instead of the night sky because they thought that method would teach us more about its mysteries. The moon is a recurring theme in Kiki Smith's feminist work of the 1990s and 2000s and often presents lunar themes as subjective experiences in a greater cosmic world. Such artists have made it clear that one view of the moon is never enough, as the lunar surface is constantly changing, tricking us with fleeting shapes we imagine on its craters. Kato's Moon Series brings ceramic sculpture into this global conversation of artists. Syowashinzan - Moon H5.5" x Dia15.7"
Sapporo - Moon H3.5" x Dia15.7"
Each of Tsubusa's moons are about 15 inches in diameter and 4 inches high, approachable and calming with their pristine celadon glaze. As you get closer, your eye is disrupted by the unglazed shapes inside each sculpture, and you are surprised to find that you can't run your hand over the smooth celadon underneath. These white shapes now kidnap your eye and create an intimate experience as you imagine different forms and meanings. When you move on to the next moon in the series, you realize that the previous experience with the moon can't be recreated, it was a unique moment between you and the sculpture. This is what it feels like to admire the moon. Are you willing to have that experience and bring all five moons into your home? Kyogoku - Moon H5" x Dia15"